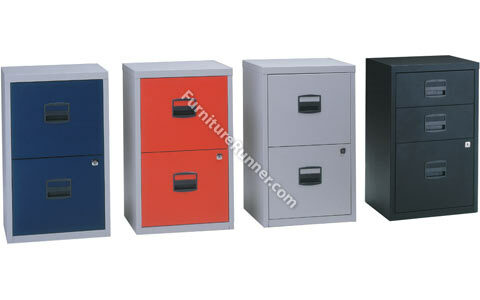 The 2 drawer version in Grey/Blue, Grey/Red and Goose Grey + the 3 drawer version in Black. Ideal for the home office. • Available in 2 and 3 drawer options. • Designed to accommodate A4 filing. • Single action lock secures 2 drawers (bottom 2 drawers on 3 drawer model). • Filers have a loading capacity of 15kg.